Once you have purchased or mined your cryptocurrency of choice it is time to secure your money. Though you can just leave it with your broker it is safer to secure your account in a wallet. There are a couple important concepts to cover before delving into wallets. Private Key: A randomly generated number which can be used to access your coins and generate public keys. Public Key: A number generated by running a private key through an elliptic curve cryptography algorithm. This key can not be used in reverse to generate the original private key. The public key is necessary for receiving coins from a sender. In order to create a paper wallet all you need to do is print your private key on a piece of paper. If you were to hand the private key to somebody you would effectively be giving him all of the money at that associated address. After printing your private key on paper you should store it securely. It would be wise to keep it in a physical safe. An easy way to generate a paper wallet is through MyEtherWallet. A hardware wallet is a form of cold storage because it is offline like a paper wallet. There are two components of a hardware wallet, one is online and the other is offline. The online component only stores your public key and can’t be used to sign transactions. In order to sign a transaction you connect the offline component which is stored on a USB device. 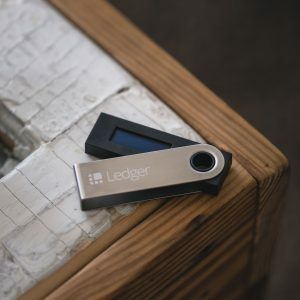 Popular options are the Trezor wallet and Ledger Nano S.
Software wallets can be installed on your device to store your private keys locally. Exodus and Jaxx are popular options. They are great wallets for day to day transactions but are less secure than hardware wallets since they operate on internet connected devices. The advantage to these wallets is that they make it easy to exchange currencies via ShapeShift integration, allow you to store multiple currencies in one portfolio, and work on many types of devices. A web wallet is an online service which stores both your public and private keys. This is convenient but is a relatively insecure way to store your keys. You have to trust the service and hope that they are not hacked. Unfortunately there have been several instances of compromised web wallets including Mt. Gox, Bitstamp, and Mintpal. Brokers often provide a web wallet as a convenience, such as Coinbase. A web wallet can be used to combine multiple transaction into one before pushing to the blockchain which reduces fees as well as providing an internal transfer service which makes transactions possible without fees. A brain wallet is created by using a memorable passphrase as a private key. An example would be using etherminingbotdotcomisthebest as my key. This makes the key easy to memorize, but unfortunately also easier to hack due to complex rainbow dictionaries. Keys based on passphrases tend to be easier to predict than you would think. ut suscipit libero. Donec ante. tempus porta. leo.